Machine made cotton quilt with 100mm cotton squares placed diagonally with peaks running around the edge. The colours are mainly autiumn tones and the patterns include checks, tartans, florals, geometric and plains. Materials were scraps left over from sewing projects such as children's clothes. There is a matching valance. 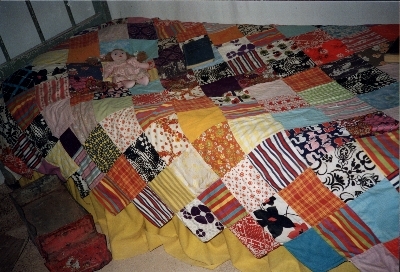 The quilt was made by Robyn Gallaway in 1971 as a functional cover for the double bed when she and her husband and 2 children lived in Bendigo. It is now on loan to Meringur Pioneer Village where it is on display.